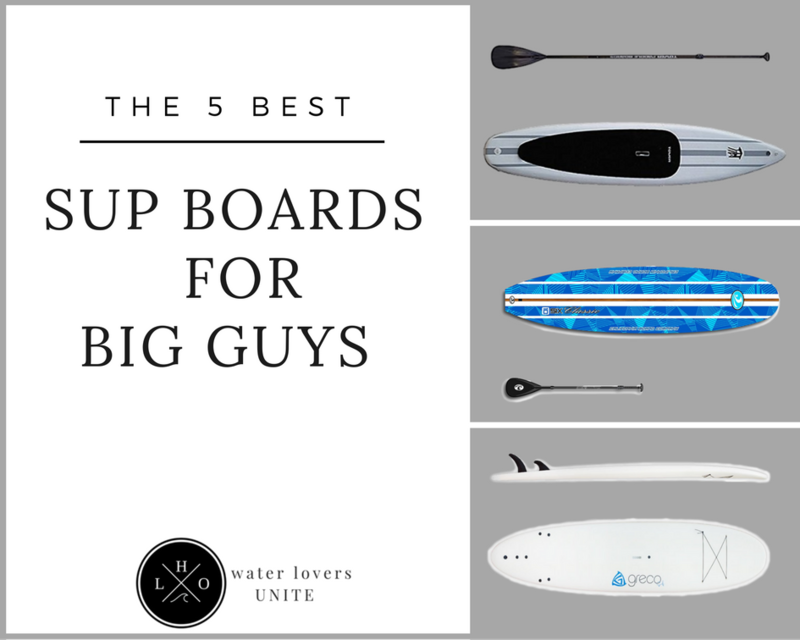 Finding the Best SUP Board for Big Guys is easier than you think. Here’s a rundown of our favorites for big dudes, including our top pick - the California Board Co SUP. 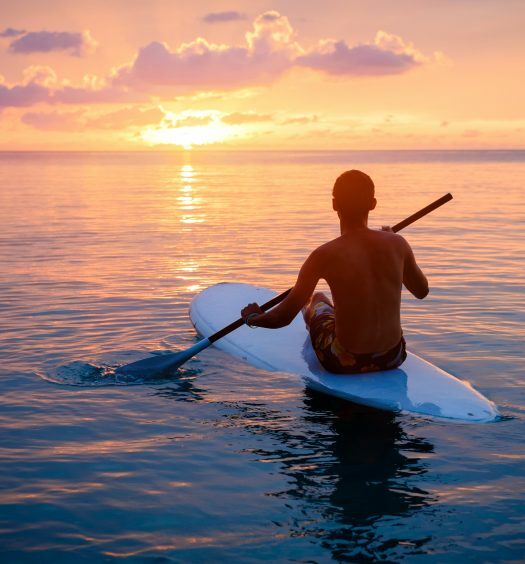 Paddle sports are so popular that a vast array of the sport’s different variations has surfaced around the globe over the years. And, my favorite of all of them is Stand Up Paddle or SUP. This sport originates from Hawaii (Hoe he’e nalu in Hawaiian), and is very popular around the world for its simplicity and all-inclusiveness. You don’t have to be a professional, nor do you have to be specially fit to enjoy SUP boarding. 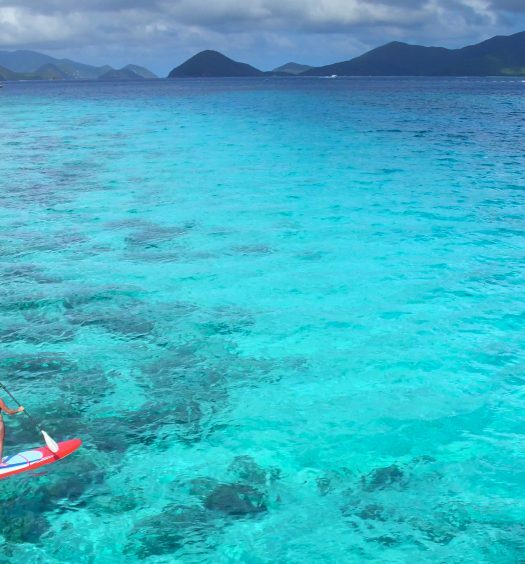 You just have to have a good board and paddle. A good board can be a challenge for big guys. The trouble is, where does one find a board of sufficient weight capacity to handle a whole hunk-a man? Well, if you are one such a hunk, you’re in luck, because we found, tested and ranked the top five best SUP boards for big guys. There are several types of boards you can choose from. Consequently, your choice will directly be influenced by what you want to use the board for. Once you figure that out, choosing a board type will be easy. Mainly, there are four types of boards. These types are flat water boards, touring/racing boards, surfing boards and yoga/fitness boards. 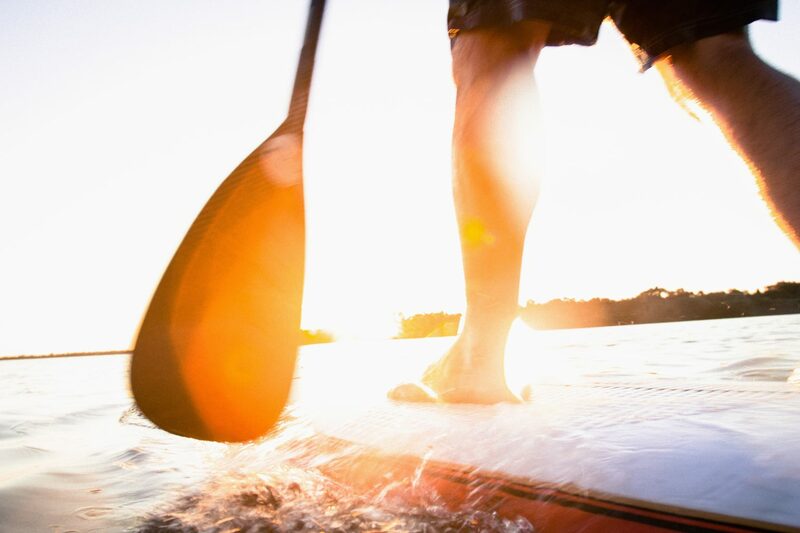 Flat water boards are the basic, all-around types. These boards are meant for easy cruising and are usually wide to provide good stability. Such boards usually have a rounded tip. Touring/racing boards are built for both long trips and for speed. These boards are narrower and longer, utilizing a pointy tip so they cut through water more easily. Yoga boards are much like flat water boards, only a bit wider and more stable. They also have a good grip tape laid down so you don’t slip off doing yoga, and to make them easier on your knees and elbows. Surf boards are shorter and narrower than most boards (usually 10 inches long), and have far better maneuverability in the surf. Also, the board can be made of hard materials, or can be inflatable. 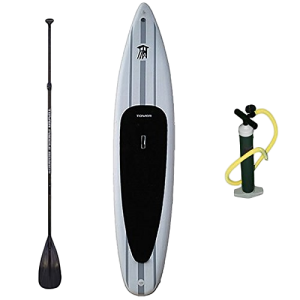 The inflatable boards are good because they are more easily stored. In addition to these types, you must consider the volume and weight capacity of the board. Volume determines the overall thickness of the board, which directly translates to board’s weight capacity. The higher the volume value, the more weight can the board carry and still keep afloat. Now on to our list. 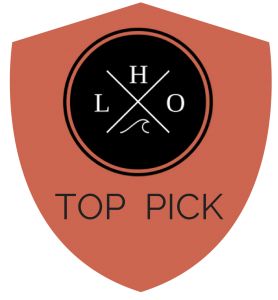 This California Board Co SUP is our top pick for the best sup for big guys. An excellent all-around board, its perfect for chill rides all day long. And it is great for bigger people, as it is rated for 300 pounds. This is a hard board made of high-quality high-density EPS foam. 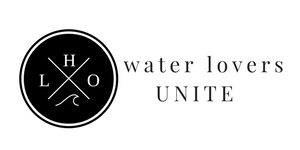 The core of this board is totally waterproof, so you don’t have to worry about water damage. The board is very wide and stable, making paddling and standing on it feel like you’re on dry land. Also, the board boasts other features. This board comes with a leash, so you can attach it to your leg and prevent it from eluding you if you fall in the water, and making it an excellent safety flotation device. It comes with a camera mount so you can take some good footage of you riding it. And as icing on the cake, you will receive an adjustable paddle, so you don’t have to buy an additional piece of gear. Easily controlled and very maneuverable board. Very fairly priced because of the EPS foam make, very light, but a little less durable. A highly adjustable paddle, excellent for fine-tuning. The Tower Xplorer board is a true racer. With a pointy tip, this board is all about cutting through the water at high speed. But what comes as a real surprise is the fact that this is an inflatable board. Oh, yes, this item is fully inflatable and deflatable, so when you want to use it, or if you’re finished, just roll it up like a sleeping bag and store it in the garage. Of course, there is always the problem of the board getting punctured, but the makers of this product have made sure this does not happen. The board is made of military grade material, and it is nearly impossible to puncture it. So, what is such a fast board doing on our list? Why, this board can handle nearly 700 pounds of weight, making it an ideal tool for heavier people or two riders, who still like to go fast and take on more of a challenge. Very easily stored and put away. One of the lightest and fastest boards on the market, Greco really redefines what “soft” designs are all about. 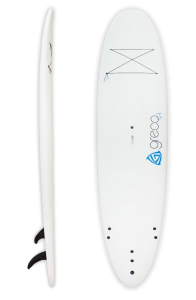 The Greco Soft Sup board is so light that any adult can probably carry it one handed. 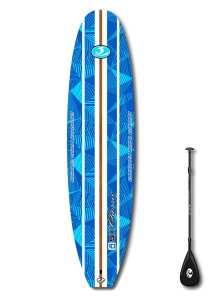 Also, because it’s so light, the board is a breeze to paddle on, and is very fast in the water, despite it being a flat water board. The board is made of light EPS foam at its core and a plastic bottom. The board’s volume rates at 196.4 liters, and is able to carry about 250-300 pounds of weight. It also comes with a paddle and a leash so it doesn’t float away. While the foam makes for a lighter board, it can be damaged if you are not careful. A very stable, light and fast board. Very maneuverable in the water. Will dent and become damaged if not taken care off, banged on rocks and concrete. Will be scratched by a dog’s claws if you take it on board with you. Another great touring board, the ISLE Airtech Inflatable board is just the thing for marathon rides. This inflatable board is the definition of sturdy. Its material is almost impregnable, so you don’t have to worry about it getting damaged or punctured. In fact, its makers are so sure of its military grade material that they are teasing you to go ahead and run it over with a vehicle and they claim that it will still leave without a scratch on it. 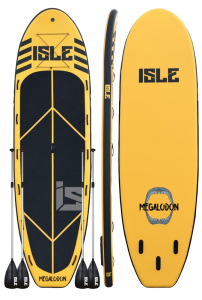 Now, we can’t say if this is true in and of itself, but we can vouch for one thing – you will hardly find a better sup board for big guys than this one – with a 275-pound weight capacity. The board is very stable and able to bear a heavy load on it – it is 6 inches thick! The board comes also with bungee straps so you can load it up with additional gear. With it, you’ll also get the pump and an adjustable paddle. It is also important to note that, despite being so thick and big, it only weighs about 20 pounds, making it very portable. A very light board for its size. Very stable on the water. And for our last board, we have another ISLE board. Like the last one, this board is also an inflatable model. And just like the last board, this one too has been made of extremely durable, military grade PVC. However, this is a supersize board fit for up to four people. Even so, the board, when deflated, is very portable and light. It comes with four paddles and a pump. The board also features bungee cords on it for storing various gear. And with a chair or two, you can easily turn it into a multi-person sit-on-top kayak. 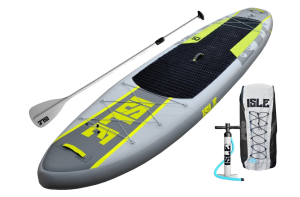 All in all, this is the greatest multi-person board on the market, and it is definitely worth buying if you are planning for family outings on the deep blue. Holds up to 1,200 lbs. Excellent board of superb make – super durable. Handles up to four adults with ease. Plenty of room on board for chairs, coolers, etc. Very lightweight and compact despite its size.